A client posed a reasonable question; could we just click on a button to reset an Interactive Report? Paraphrasing the conversation, the genesis of this request was that in order to reset a report we need to click Actions > Reset > Apply. That’s three clicks for what I would like to accomplish with one – said the client. The code above is best if specified globally for the whole application (when Page Loads). The “IF” with typeof is to make sure the IR widget is present in the page, when your page does not contain an IR, the widget code will not be there and this call will fail. However, this method may require you also specify the Report in question (via the REQUEST ). Also, you could use the API call APEX_IR.RESET_REPORT however it gets cumbersome to specify the currently selected report_id or report_alias. Plus it requires a page submission and that’s not always ideal. DISCLAIMER: Because this method uses a private method call, it may change in future versions of APEX. 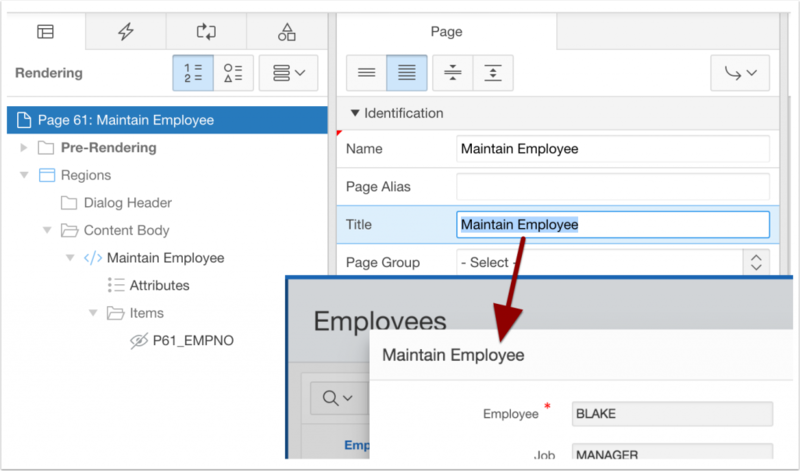 You may be familiar with the handy Substitution String #TIMING# in Oracle Application Express (read more about TIMING and other Substitution Strings). When you add it to the footer (or header) of a region you get to see how long it took to run. It’s pretty nice, but you may not want to display that value all the time. It’s sure nice during development. So why not make it optional? Or toggle it on or off? 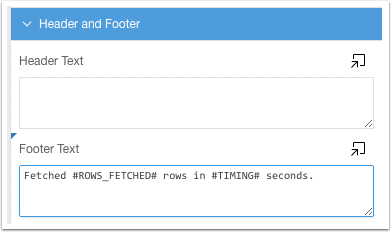 Then the “Show Layout Columns” button on the APEX Developer Toolbar can be used to toggle the visibility of your timing entry. Maybe this gives you other creative ideas, share them in the comments. 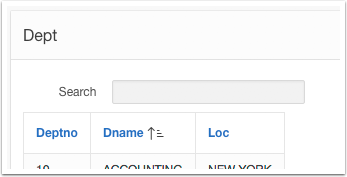 The #TIMING# value only makes sense for report regions and it couldn’t meassure AJAX processess. Looking at the TIMING Substitution String is not a replacement for the Debug information generated by APEX. APEX 5.1 introduced native functionality for warning the user when they attempt to navigate away from a page when the page contains unsaved changes. However, this feature doesn’t track items created via the APEX_ITEM API. Which brings me to the poor man’s Warn On Unsaved Changes. Use a regular text item (we’ll call it “Pn_COUNT_CHANGES”) on the page to track changes using the native functionality. I default it to zero (so it can be incremented as a number). Add some CSS to the page to hide the Pn_COUNT_CHANGES item. You don’t want it to be a hidden item because then it will not be considered as part of the page changes (plus it would need to be unprotected). I admit this is a complete hack. It would also be enough to change the tracking item from 0 to 1, there’s no need to increment the value. That said, I like the idea of incrementing the value and if you implement something more complex undoing changes and decreasing the counter (if you set it back to the original value there would be no warning). Perhaps a more native approach and some would argue even elegant, would be to use apex.page.warnOnUnsavedChanges. This API receives two parameters: pMessage and pExtraIsChanged. pExtraIsChanged is a function that you control and inside you can code the logic to track your changes. But that’s a completely different blog post. However, with the current CSS grid implementation of the Universal Theme, this type of layout is not possible in a declarative way. Depending on the screen size, you always end up with some extra space. It basically finds the div for the label and changes the with to whatever the grid wants (a fixed percent) to automatic. By making it automatic, the width will now be the length of the label. Have you been thinking about submitting an abstract for Kscope? The submission deadline for Kscope18 is fast approaching! Submissions close on January 5, 2018! Some of you may still be struggling to think of some topics. I’ve asked Dietmar Aust (Kscope18 APEX Track Lead), and Helen Sanders (Kscope18 Database Track Lead) for help with some topic ideas that would get your creative juices flowing. Scroll down and browse through the topics that are sure to trigger some ideas. Aside from these general ideas, it is always great to hear about real-world projects. How were they approached? What were the challenges and which lessons were learned? This will help others to use good judgment and avoid problems proactively. Finally, I should add, the list below is by no means inclusive. There are many other topics you could cover. Development tools for troubleshooting, test automation, documentation, performance optimization, deployment automation, etc. Security; how to detect that information was leaked and/or stolen? Modularization and Reuse: How can we extend APEX using plugins and how can we reuse code most effectively? 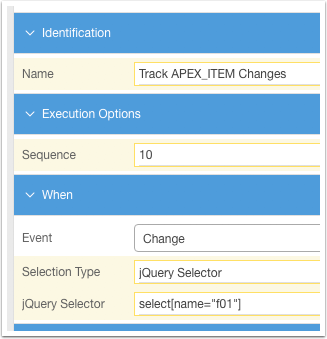 What is new in APEX 5.2 and why does it make a difference? This little question on Twitter prompted me to record this brief video. I recently had this requirement for freezing the column and header on a Classic Report, just the way you can with Excel. The report had too many columns and once you scroll horizontally or vertically you would loose track of the information you’re seeing. It turns out freezing the header is pretty straight forward and it’s even out of the box functionality on the Interactive Reports, but not for Classic Reports. If you only need to freeze the headers, just head over to Marko Gorički’s blog “How to make any table header sticky” and be done with it. However, freezing columns is a completely different technique from freezing a header, or it requires special markup. Ideally, I didn’t want to create a Custom Template (even though, you know, I’m a big fan). After some discussions and good advice from my buddy Vincent Morneau, I began scouring the interwebs for a suitable solution. This JSFiddle https://jsfiddle.net/RMarsh/bzuasLcz/3/ seemed very promising and easy to adapt to Oracle APEX Universal Theme markup. It seemed to me that I had to adjust selectors. So table became table.t-Report-report, thead became table.t-Report-report thead, and so on. You get the idea. Then, after a working prototype, I saw the opportunity to bundle everything in a nifty easy to use APEX Plugin. You can find the plugin in apex.world and Github https://github.com/rimblas/apex-freeze-col-headers. Maybe you will find it useful. 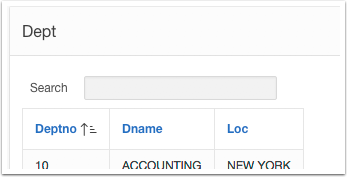 Create an “After Refresh” Dynamic Action on the Classic Report you want to “freeze”. Make sure “Fire on Initialization” is Yes. 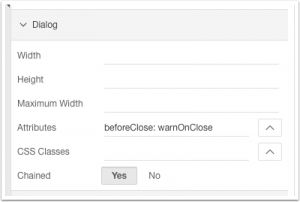 As you may already know, APEX 5.1 implements native Warn Before Exit functionality. Basically, if the user makes changes on a page and tries to navigate away before they save their changes, they get a warning. Modal Pages also get this feature, with one caveat; the close “X” on the window does not warn. As I understand, this is was the intended behavior. However, for some use cases, I disagree. For this reason, and after a client’s request, I came up with this solution. Line 2 and 3 are the most important to this whole solution. 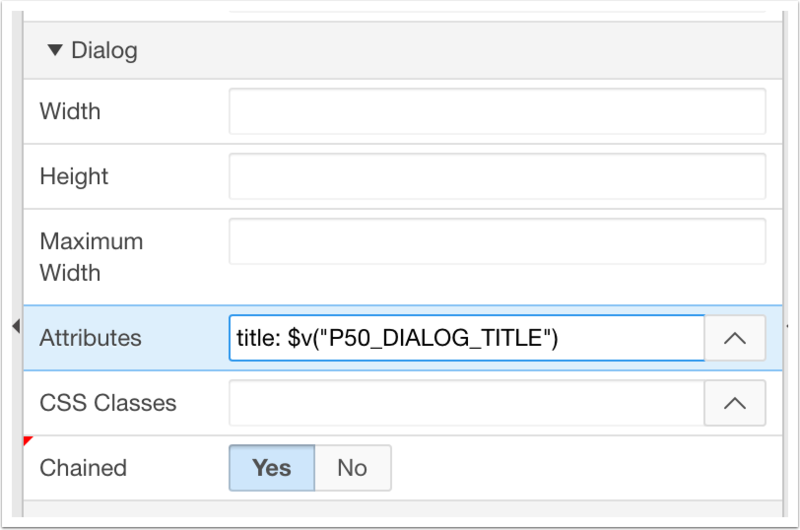 Modal Dialogs run inside an iframe. As such, the calling page needs to take a peek inside the dialog and see if something was changed. Line 2 gets a hold of the “apex” namespace for the dialog. Line 3 can then check is anything has changed within it. Finally, line 10, prevents the close even from happening and maintains the dialog opened if they user opts to stay. I should mention, I tried to use apex.message.confirm instead of the more rudimentary confirm, however because we’re already inside a modal, calling apex.message.confirm would invariably end up closing the modal I wanted to keep open. Perhaps, there’s a way to accomplish this, if you have any ideas, please share in the comments. 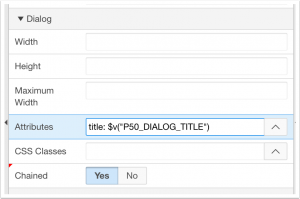 Modal Dialogs in APEX5 use the Modal Page Title attribute as the Title of the dialog. When “dialogcreate” event fires, we override the dialog “title” option with the title we want. I have something to confess, but it shouldn’t come as a surprise – I’m not a very good DBA. … but I’m not supposed to be… I’m a developer! Sure, I can discuss configuration options and architecture, but don’t ask me to install anything. This is why I need to say “THANK YOU!” to the Oracle Technology Network for their Pre-Built Developer VMs. By providing a Virtual Machine, that runs on VirtualBox (free), pre-configured with the latest and greatest technology, I can work, learn, and play freely. It’s an incredible benefit that I don’t take for granted. Check out what others are thankful: Search #ThanksOTN.